The Electronic Entertainment Expo (E3) is a gaming convention where everyone from the video game industry can showcase their latest products to the world. 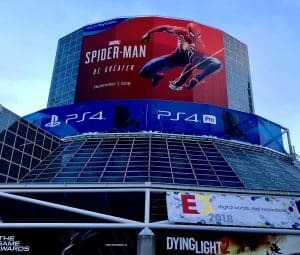 Since its birth, I have always wanted to go to E3 because I love playing video games. So by the power of all seven Chaos Emeralds, at long last, I was able to go to an E3. Fast-forward to day one of E3 2018, it was time to play some video games with Kingdom Hearts III, Forsaken (Destiny 2), Trials Rising, Shadow of the Tomb Raider, Jump Force, and Soulcalibur 6 all being my first targets. With the Kingdom Hearts III demo, you control Sora, and basically, hit one button to get multiple combos going, while a lock on system will assist you through your fights. Nothing too complicated to understand, in my opinion. But before playing, the demo allowed attendees to either play in the Toy Story world or on Olympus (Hercules). I went with Toy Story due to being a major fan of Woody and Buzz. The Toy Story demo has you meet Woody and Buzz in Andy’s room, as well as their friends to battle countless waves of enemies in order to progress through the level. I must say that the voice actors really did sound like the original ones from the movies, so kudos to whoever did the hiring! The visuals, meanwhile, were amazing to look at. Once I defeated the first half of the level, I was able to enter Galaxy Toys. This is the final section of the demo which becomes a first-person shooter (instead of third-person) when you pilot a toy mech. Once the level was done, I did not want it to end. Sadly, there wasn’t enough time to try the Olympus level. Regardless, I still had a blast playing Kingdom Hearts III, as you could tell. It should be noted that I played the demo on an Xbox One X (The PS4 wasn’t available at the time of my visit) and the full game is being developed by Square Enix Business Division 3. It will be out early next year. 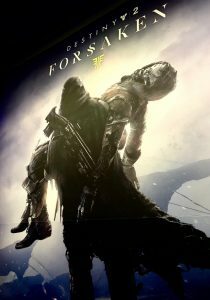 The second demo I tried was Destiny 2‘s new game mode called Gambit, which will be part of the upcoming Forsaken DLC this September. In it, you have two teams of four competing with each other, who must kill multiple waves of enemies that will drop bankable motes. These motes must be banked into a collection chamber. By doing this, mini-bosses will appear on the other side that will slow down your opponent from summoning the main boss. Once reaching a certain score, a “Primeval” boss will appear, and whoever beats theirs first, wins the round which is a best of three. In the madness, a player can ‘invade’ the other side by going through a round gate when activated, in order to disrupt the rival team for 28 seconds, which will also heal up a “Primeval.” Basically, it is PvE meets PvP. The invading mechanic was my favorite part of the whole demo. I was doing so well that I had two Bungie employees watching my screen the whole time I was playing. I will say that even though I enjoyed playing Gambit, I do wonder if this mode will become ‘boring’ after the novelty wears off? Only time will tell. By the way, the exotic bow weapon felt slow for this type of chaotic gameplay, since you have the pull back before shooting. The Titan I used, however, was not slow! His super was great to control, which allowed the character to ‘fly’ around the map in order to smash the enemy to smithereens. The map itself had ruins/trees, as well as a beach with the collection chamber being located at the middle of the map. And finally, the enemy AI is randomly selected before a game begins. Over at the Bandai Nemco booth, I got the chance to try Soulcalibur VI and Jump Force. Both where five-minute demos, so it was one match and done, although I did have a good time playing as Goku in Jump Force (versus the CPU), as well as using Kilik (against another person) in Soulcalibur 6. The Jump Force demo had six characters yet no story mission to try out. The controls, meanwhile, felt good and responsive while the glossy/realistic-type world looked fine. Yet I sort of wished it was like Dragon Ball FighterZ in the graphics arena, which looked like it was the anime. But for now, it should be noted that the full game will be out in early 2019 which is being developed by Spike Chunsoft, published by Bandai Nemco. As for Soulcalibur 6, which will be out this fall, the game ran smoothly and the guard/parry mechanics, as well as the vertical/horizontal attacks, were satisfying to learn even though my hands-on was fast. The visuals also looked great, which was being powered by the Unreal Engine 4. The next demo was Eidos Montreal’s Shadow of the Tomb Raider. From what I played, it basically plays like the previous Tomb Raider games (in third-person, control Lara Croft, solve puzzles, fight bad guys, etc. ), with the stealth combat providing a challenge. But if fans do not want to be ‘stealthy’, you can choose to be loud and deadly, thanks to the responsive controls. Thus I did enjoy using an AK-47 as if I was Rambo. The third entry takes place shortly after the events of Rise of the Tomb Raider and I believe the location is the tropical regions of the Americas. Of course, Lara has to save the day from a evil group that wants more power. The visuals, meanwhile, looked amazing but I am curious to see how well this game will sell when it comes out on September 14, 2018, for the Xbox One, PS4, PC. Hopefully, there’s no Tomb Raider fatigue setting in. Trails Rising was the last game of the day, which was located at the Ubisoft booth. This game has you control a dirt bike, with the goal of doing tricks/complete the specialized levels. Now Certain difficulties will give gamers a problem at first, but once fans understand the physics/design of each stage, as well as the dirt bikes, the game really becomes fun and satisfying to master. Who doesn’t like making loops in the air? By the way, the in-game graphics did looked nice (loved the bright colors) and the game itself ran smoothly as well. Overall, I liked what I saw from the RedLynx/Ubisoft Kiev game. Trails Rising is scheduled to come out in early 2019 for the Xbox One, PS4, Switch, and PC. And just like that, day one was in the books! Yes, the South Hall did get crowded once the general attendees were let in, and the show floor did get very warm right after that. But I did not care, because I was having fun experiencing my first E3! 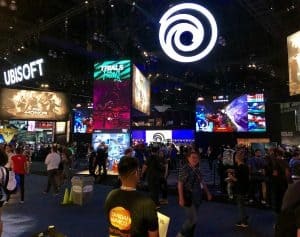 You want to talk about E3 2018? Then head over to the FoCC forum by clicking HERE to keep the chat going. Until next time, keep on playing your favorite video games and please keep following the blog, as I will be covering E3 for the FoCC crew!